A spacious, clean and comfortable family friendly home base while in Fiordland. Mt View Lodge is a home new to guest accommodation. The spacious rooms and multi-layered layout, make for a comfortable home base while exploring Fiordland. Mt View Lodge is three bedroom - two bedrooms upstairs sharing the recently renovated bathroom with separate toilet. The spacious SuperKing bedroom has bifold doors to the balcony looking out to Fiordland mountains. A large wardrobe and bedside cabinets. Overhead reading lights. The other upstairs bedroom is a twin - with a double bed and a single bed. Another large room - the wardrobe contains toys, games, children's books, a portacot and highchair. Both upstairs rooms share a bathroom with their own entrance. Separate toilet. Downstairs there is a queen room with wardrobe, luggage rack and large window with views to the garden. Off the hallway is the second bathroom, also with separate toilet. Also the interior access for the basement garage which houses the front loader washing machine, dryer and tub. Outdoor line+pegs, clothes horse, iron and ironing board. The garage accessed directly from the street, with plenty of off road parking also. Outdoor furniture, BBQ in the back garden where fabulous rural view. Plently of comfortable seating in the light bright spacious living area. Books, games, Large flat screen tv, digital tv and complimentary wifi. Open plan with a roomy fully appointed kitchen, pantry, fridge-freezer, dishwasher, microwave. Table seating for six. Dining views to mountains, open paddock (sometimes sheep) and garden. Air conditioning heat pump and additional oil heaters. Super house. We welcome you to stay. Kia Ora and Welcome to Mt View Lodge. I am a long time Manapouri local, happily working within Fiordland tourism, for my years in the area, in roles such as hosting on the now decommissioned 99 year old vessel Tawera, taking freedom walkers and stores across Lake Te Anau to the beginning of the Milford Track. I am familiar with the Fiordland Gems Doubtful Sound and Milford Sound - spending many evenings at both Sounds- and am more than happy to recommend cruises and activities that will fit best with your group's needs. Mt View Lodge is tended to a high standard with all linen laundered at the home. Mt View Lodge is a real home, happily shared so you may truly relax and make Manapouri your base for the duration of your Fiordland adventure. May you enjoy this super home. Mt View Lodge is moments walk from the Doubtful Sound departure point, river and bush walkway to the lakefront. On one of the three main Manapouri streets, so very central and very easy to find. Upstairs shared bathroom has a separate toilet. The corner shower is in a light well lit room with a tidy vanity and mirror. The downstairs bathroom is an older style room. Attached head Shower, vanity and mirror. Opening window. Separate toilet. A peaceful, friendly village nestled on the shores of Lake Manapouri and the Waiau River. Throughout the house various views of Fiordland National Park mountains. Rural feel. Complimentary freshly laundered linen, washed and sun dried at Mt View Lodge. Plenty of parking for boats and vehicles. Street access garage - room for two. Complimentary freshly laundered towels, washed and dried at Mt View Lodge. The most stunning Golf Course 20km drive to Te Anau. Doubtful Sound departure point across the road. 5 minute walk. Lake Manapouri Beachfront 5 minute walk. Restaurants , store , bars and fuel station 5 minute walk. Excellent home with lots of room! 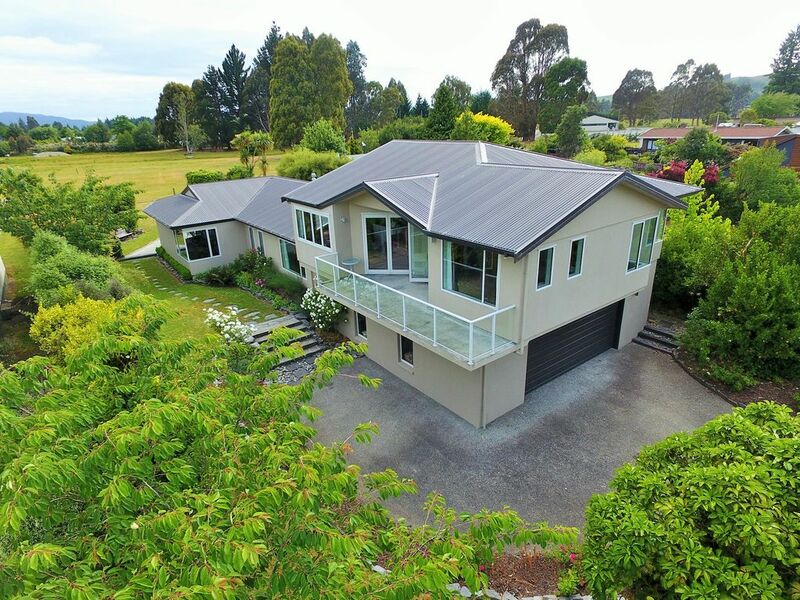 Beautiful home in Manapouri was a perfect spot to base travels to both Doubtful and Milford sound. Have a great time. A great spot to spend a few days en-route to Doubtful Sound! We really enjoyed the place! Great for a big family. We stayed here 3 nights as a base to visit Milford and Doubtful Sounds - it was a great location for doing this. The house was well equipped and very comfortable for our party of 4. It is within very easy walking distance of the shop and restaurants and only 10 minutes walk from the Manapouri dock for Doubtful Sound boats. It has a nice garden that catches the afternoon sun. Recommend. Good base to explore the area. Very clean and well stocked with everything you might need.Quiet neighborhood.The information book supplied for the guests was very helpful-we had coffee at her friend's pop up coffee stand on the road to Milford! The house is really great, modern facilities, large and spacious, ideal location for our trip to Doubtful Sound. Thank you Sallie for letting us stay in your home! Such a wonderful comfy and clean place, we felt right at home. Perfectly located to explore the area. Doubtful Sound departure point. Milford Sound 2.5 hours. Southern Scenic Route town.